I did a webinar today for the BISG and below are the slides from that presentation. Q: Tell us a little bit about your report: What made you decide you wanted to do this and what was your objective? A: Last year I completed a similar report (although the 2019 version is more detailed and comprehensive) and received more positive feedback than I expected. As a result, I decided to expand it and devote more time to interviewing as many of the companies profiled as I could. Initially, for the 2018 report, I was motivated partly by my experience raising capital as CEO of Ingenta. I needed comparative data on market competitors but there was no market research to be found. There is also no research available on levels of technology spending in publishing which was (and remains) a point of frustration for me. My objective was partially personal and professional-- I want to be seen as an expert in this area. A lot of money is being spent on technology by publishers and I felt, given my background, that I had something to offer companies looking to invest in new technology solutions. I had also never undertaken a market research project on my own before and tried to sell it. So that part was an experiment, and it turned out well. As I said, more industry insiders reacted favorably than I expected. As part of this report, I created a market map of all the software players and I think many were excited to see all these companies – over 100 – depicted graphically in my diagram. Q: What do you think are the biggest issues currently facing the companies you have profiled? A: Well, they’re probably different for each-- of course, every company has its own view. But I think there are universal challenges facing most—if not all—of the companies serving this market. The first is that technology has been undergoing significant change over the last 5-10 years or so: Locally-installed software is giving way to hosted and subscription-based business models. Code is now built on the basis of open architecture so that applications can be woven together and data and services exchanged from machine to machine. Publishing and media are generally conservative businesses and-- generally speaking--companies serving this segment are by no means leaders in addressing these changes. So most, if not all, of the vendors in my report are going through some type of technology rearchitecting, and this can be perilous if not managed well. The happy thing is that, because the pace of change in publishing is slow, these companies can be fairly methodical about their approach. For example, I see companies like Fadel, Klopotek and Silverchair executing well through this transition. In my report, I tried to depict this technology evolution in what II call my ‘velocity chart’--look at it and you will see most companies at an inflection point at the small end of a funnel. As they invest in new architectures, they begin to quickly move out of this funnel and put greater distance between themselves and companies that have not invested. Thus, companies investing in technology achieve a better competitive position against their rivals who do not invest. Some of the laggards will get left behind, I believe. (I’m not naming names here but I do in the report). The last issue is universal in this space and that is the relatively small size of the companies. Most are less than $15MM in revenue, though there are one or two closer to $20MM (CMS/hosting companies Atypon and Highwire are considered larger.) 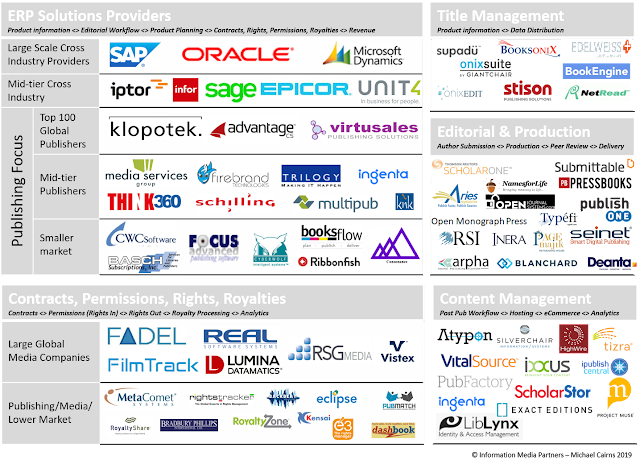 These industry providers retain the benefits of delivering very tailored products to publishers which precisely fit their needs. On this basis, the companies can compete very well against far larger software companies such as SAP. Where size is a limitation as in the provision of ‘on-call’ expert resources and project teams for large-scale implementations, especially if the company has been lucky enough to win multiple contracts at the same time. These smaller companies don’t have the financial strength of the medium- and larger- sized companies. One other thing related to this point: Most of these players do not work with integrators (third parties which can implement their software) so the only implementation option for customers is the software developer. In my opinion that is a problem that hampers business growth. Q: Who are the buyers of your report? I think prospective buyers get “sticker shock” at the $1,500 price tag--though I do offer some free consulting time with a report purchase. I do have a discount code: THANKS2019 which is available now. Q: Presumably you have clients who make use of the report and do want advice on the process of selecting a technology provider. What advice do you give them? A: Naturally, all situations are different. But first off, it's important to understand the circumstances in which the company finds itself. For example, what is driving the business to take the decision to replace their ERP or CMS? One company which recently declared bankruptcy had, only a few years ago, replaced all of their financial systems with a very expensive Oracle solution. Their motivation was that the older solution couldn’t support the new business models and strategy the company wanted to execute. But, hindsight being 20/20, it was poor judgement to engage this costly project before there was any indication the new strategies would work. Now, with the business in bankruptcy, the expensive system supports much less revenue than the resilient legacy solution would have had no problem supporting. Proceed with caution: These projects are expensive, disruptive and rarely go smoothly. Your business has to be tough and well managed to execute effectively. That is especially true if your business is less than $50MM in annual revenue. Another thing I would point out is that it is not necessary to do a full RFI/RFP process. Compiling a set of high-level requirements and bringing in three or four vendors can save time and money-- and you will learn a lot in the process. Additionally, if you have someone like me to help navigate this process (generally without a vote on final selection) it will go a lot more smoothly. The last thing I’d mention is that you should have a good idea of your current technical environment, architecture and costs. These new systems will likely need to interface with other existing systems (some of which will also be replaced) and mapping out all these intersections in advance is an important requirement. Data conversion and interface work is likely to be one of your project's biggest time and cost demands--starting early to understand the scope of these activities is time well spent. Q: What else would you like publishers to know? A: I think my bias is that I’d rather see publishers spend technology dollars on product development and ‘front office’ applications which directly support revenue generation or growth. Minimize spending on supporting applications for accounting, quote/order to cash, rights and royalties and title management and editorial solutions. Matching cost effectiveness with process efficiencies should be a primary consideration when looking at these solutions. If you have $100 to spend on technology, don’t spend $95 on business applications—give yourself the flexibility to spend more on supporting revenue growth, new products and customer development.